If publishers are good at one thing, it's publishing. If they're good at two things, it's publishing and consecrating every aspect of the paper book, until changing anything about it seems unthinkable. This week's e-crisis: The Death of the Cover. If you notice the jackets on the books people are reading on a plane or in the park, you might decide to check out "The Girl With the Dragon Tattoo" or "The Help," too. This no longer happens with ebooks, because the backside of ebook readers don't promote anything except ebook readers. So, basically, the implicit question is: How will people ever know what to buy, if not by craning their necks to see what the cute girl across the subway car is reading? And who will compensate the publishing industry for this lack of free advertising, which they are entitled to? The answers: We'll be fine; and shut up. Yes, people who would have purchased a book because they saw three people reading it at Starbucks may not purchase said book in an ebook world. But they might purchase another book, because they saw it on their buddies' Twitter feeds, or because iTunes spat out some kind of automated recommendation for them that's actually grounded in data, beyond their 20-person, Dan-Brown-biased coffee shop sample group. 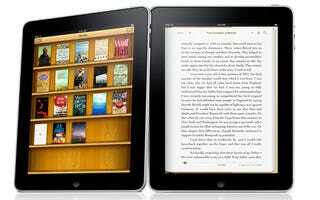 More to the point, the loss of this totally unquantifiable benefit to publishers is probably—and probably massively—offset by the fact that all these secretive ebook enjoyers are now, at all times, just seconds away from tapping into a vast digital bookstore, which delivers books in a matter of seconds. A lot of cities don't have places where people gather and read, decent libraries, or even a major book store. So, publishers, focus on this vast, new, and unexplored market that's about to explode—not a granular little non-issue, that's really just another formulation of "but it's just not that same, man!"